Gene Richardson of Hampden flies his Cessna 182 as a volunteer for Angel Flight Northeast. A few times a month, Gene Richardson fuels up his Cessna 182 airplane and takes it up into the skies over Maine. But he doesn’t just fly for his own pleasure. Richardson, of Hampden, is one of many volunteer pilots who, through Angel Flight Northeast, provide free transportation for patients requiring medical treatment far from home. “I do it because I can do it for people, and I get a lot of satisfaction out of that,” Richardson said. In Maine, the flights generally pick up patients from isolated areas in the north and west and shuttle them to medical centers in metropolitan areas such as Portland and Boston. “If someone has to go Boston for cancer treatment and they’re coming from Presque Isle or Bangor, I mean that’s a long, long way to drive, especially if they have to do it several times a week,” Richardson said. Angel Flight is made up of a number of chapters serving residents throughout the United States. Headquartered at the Lawrence Municipal Airport in North Andover, Mass., Angel Flight Northeast was founded in 1996 to serve the six New England states as well as parts of New York, Pennsylvania and New Jersey. Since its inception 16 years ago, Angel Flight Northeast has coordinated more than 62,000 flights, bringing 60,000 patients to 189 health care facilities in 33 states. The nonprofit has been able to fulfill most of the flight requests it has received from more than 13,000 patients in Maine, according to Keith D’Entremont, director of community and corporate outreach at Angel Flight Northeast. “Basically when they can’t afford to get where they need to go or they’re not healthy enough to drive, we provide transportation,” he said. D’Entremont said Angel Flight Northeast works with about 1,000 pilots, whose individual time commitment varies, with some pilots flying several times per week. There are 33 Maine-based pilots on the Angel Flight roster, he said. Angel Flight pilots are volunteers — they fly on their own dime, paying for fuel and other costs out of pocket, and on their own aircraft. 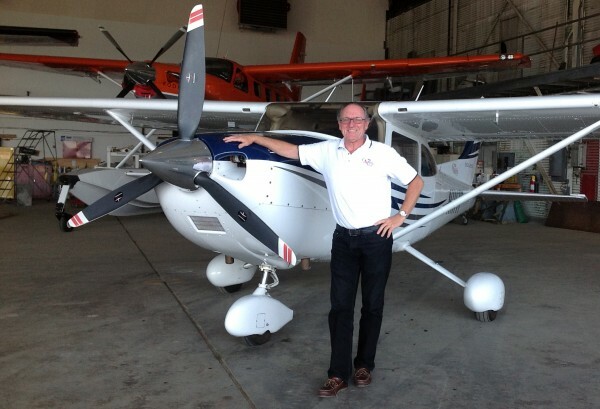 Richardson said it costs him about $200 per hour to fly his Cessna. Besides being able to provide a service, Richardson and other Angel Flight pilots get perks from flying for the organization. The flights provide opportunities for the pilots to practice, keeping them current on their skills. Many airports waive all fees for Angel Flight pilots, allowing them to practice flying into busy locations they can’t otherwise afford. “I fly into Logan airport with my single-engine airplane and I would never be able to do that if I wasn’t doing Angel Flights, because it would be cost prohibitive,” Richardson said. Richardson estimated he has flown about 90 Angel Flights since he began volunteering in the late 1990s. He said he usually volunteers about three or four times per month, though he’s currently out of commission following knee surgery. Angel Flight pilots do not accept tips or gifts for their services, but Richardson said the patients he transports make their gratitude known.